The San Antonio Public Library (SAPL) is the public library system serving the city of San Antonio, Texas. It consists of a central library, 29 branch libraries (as of the fall of 2017), and a library portal. SAPL was awarded the National Medal for Museum and Library Service in 2006. In 2003, SAPL celebrated its centennial. New patrons received special centennial gold library cards instead of the usual purple cards. 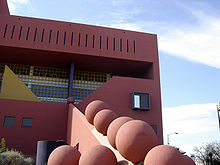 The centerpiece of the library is a two story glass blown sculpture named "Fiesta Tower". It was created by Dale Chihuly in 2003. In addition to the Central Library, SAPL has 29 branch libraries located throughout the San Antonio area. Some branches offer walking trails, fitness stations, and/or playgrounds. During election season, certain locations become voting sites. ^ "Institute of Museum and Library Services Announces 20th Anniversary of National Medal Program". Institute of Museum and Library Services. 19 February 2014. Retrieved 1 May 2018. ^ Dillon, David (October 1995). "Texas Flower". Architecture. Vol. 84 no. 10. pp. 81–86. ISSN 0746-0554. ^ MacCormack, John (31 December 2011). "Legorreta's legacy: enchilada red". San Antonio Express-News. ^ Turner, Drexel (Fall 1991). "Going South: The New San Antonio Main Library" (PDF). Cite. Rice Design Alliance. Retrieved 30 April 2018. ^ Mathis, Don (8 May 2015). "The Big, Red Central Library Turns 20". The Rivard Report. Retrieved 23 April 2017. ^ Zapatos, Craig (2004). "Chapter 3: The San Antonio Public Library". In Webb, T.D. (ed.). Building Libraries for the 21st Century: The Shape of Information. McFarland & Company. pp. 41–49. ISBN 0-7864-2034-0. ^ San Antonio Architecture: Traditions and Visions. AIA San Antonio, a chapter of the American Institute of Architects. 2007. p. 72. ISBN 978-1-4243-3424-7. LCCN 2007923954. Retrieved 1 May 2018. ^ "Central Library". San Antonio Public Library. Retrieved 3 May 2018. ^ "Locations". San Antonio Public Library. Retrieved 2 May 2018. ^ Cowart, Caitlin (Fall 2017). "Feed Your Freedom at the San Antonio Public Library" (PDF). Texas Library Journal. 93 (3): 80–81. ISSN 0040-4446. Retrieved 2 May 2018.